and smoke a pipe for the official photoshoot. so we won’t be going for that authentic touch, either. 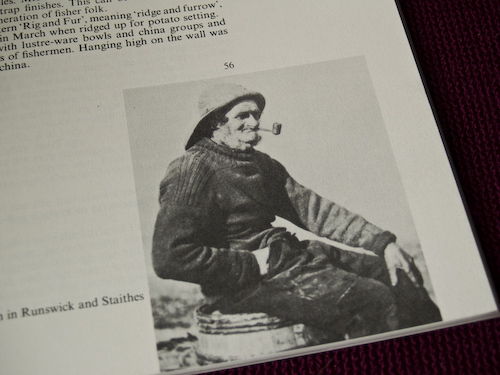 I love this book for its treasury of sweater designs and careful attention to the differences from one little cove’s worth of knitters to the next, and also for its photographs of crusty old fisherman. This is only one of the fabulous portraits it offers, although Gladys writes that it’s her favorite. I couldn’t tell, though, what might happen at the back of that particular old sweater, so I had to devise a way to raise the neckline at the back, as you see above. See, too, how the maple leaves are changing. A last gasp of summer came through in the guise of a blustery hot wind that littered the sidewalk with roughly four thousand treacherous gum nuts from the hundred-year-old trees in front of our house, so it’s officially raking season. I’d like to pretend there’s another month to go before we really reach leaf fall, but I fear for the neighbors’ ankles. Our sweet gums are fine handsome old trees, but they are more accomplished than any other tree at protracting the drop of their pretty, star-shaped leaves over many months and then continuing to bombard unsuspecting passers-by with their spiky seed pods even after the leaves are gone. This year I see they are celebrating their centennial by growing a number of large clusters of conjoined pods, like gum nut rat kings, which will prove especially uncomfortable if they drop on people’s heads. You may wish to wear an old-timey felt hat for protection if you’re strolling in the neighborhood… fair warning. Luckily, I own several. I may need to knit a few more. 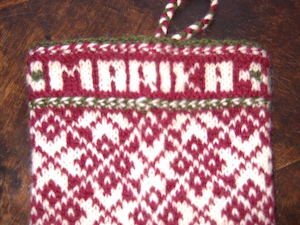 Thank you all for the excellent resources on intarsia in the round that flooded the comments! Special appreciation to Rodger, who tipped me off to an excellent book that was already right under my nose. I took Priscilla Gibson-Roberts to bed (um, you know what I mean) that very night to read up. I have begun a swatchcap to practice my Invisible Join 1. (I tried Invisible Join 2 at first, but it quickly got the better of me and left my circular needle locked in a contorted figure 8. I am sure this is my fault and not Priscilla’s, but I was too tired to work out what I’d done wrong.) We’ll evaluate the results together in a couple of days. The Ivy stole edging is a marathon, not a sprint, or even a mid-length training run. I’m on row 19 of 50, and those rounds are getting longer and longer – something in the neighborhood of 1700 stitches at this point. It takes me a standard-length movie to do two rounds; a showing of Planet Earth New Zealand (aka The Fellowship of the Ring) the other night was good for a whopping 3.5 (it would go a little faster if Addi would make the Lace Points in the size and length I need). I just ran out of the second ball of ArtYarns Cashmere I – thank goodness I had the foresight to pick up a third skein of the same dyelot when I noticed the new shipment at Knit/Purl was a slightly different shade! It’s pointless to show you pictures of my progress: the edging is picked up on a 47″ US #0 needle, so all there is to see is a big scum of lavender froth with stitch markers around the edge. I’m almost done with a secret project for Shibui, so naturally my mind has wandered to what’s next. I’ve got something in the hopper for Popknits that I’m very excited to cast on, and I’ve been mulling over possibilities for the new Casbah. The confluence of the new Interweave Knits summer issue with Megan’s post about knitting cowls with doubled sock yarn turned on a light. Look at all the complementary sock yarn I already have in the stash! Counterclockwise from the left, that’s Socks That Rock Lightweight in Amber and Mica, Dream in Color Smooshy in Gothic Rose, Lorna’s Laces Shepherd Sock in Cedar, Socks That Rock Lightweight in one of the colorways with rock names they don’t seem to offer anymore, and of course the Casbah. All mostly superwash merino. 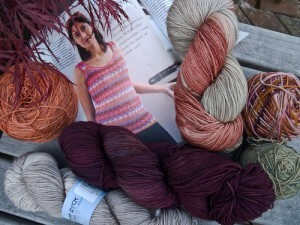 Of course, a worsted-weight wool tank top makes no sense. But what if I shortened the body of the Confectionary Tank and wore it as a vest next fall? I couldn’t help myself. I started swatching. The design-minded among you will notice that the sidebar’s looking a little less scraggly. I owe Mr. G for this. You’ll also see there’s a link to his company website: one of the reasons I knit so much is that my partner for social activities is pouring all his energy into launching a small business. I think you can only know what an effort that requires if you’ve actually done it yourself. We certainly didn’t comprehend what we were in for when we took the decision for Mr. G to leave his job to work on SweetSpot full time. We saw a need within his family for better communication about his father’s diabetes; we saw that Adam had the skills and the passion to do something about it and to extend the project to other families in the same situation. He’d wanted to start a company of his own for years, and we thought now was probably the time to try: we don’t have kids, I have a job, we have some savings put by to cushion us for a year or two. 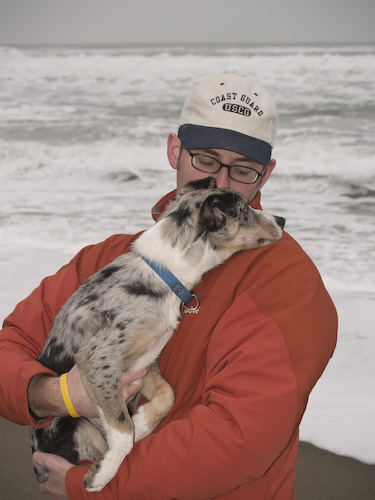 Neither of us fully imagined the emotional drain, or the way every conversation we have would turn to the business, or the frustration of trying to bring in the support and relationships necessary to sustain a worthy one-man project. But SweetSpot is out in the world now, and if you or someone you care for lives with insulin-dependent diabetes, you might find that Mr. G’s service can help in the daily work toward wellness. It fetches, stores, and analyzes information from blood glucose monitors, and it offers a teamwork structure to make family participation simpler and more constructive. 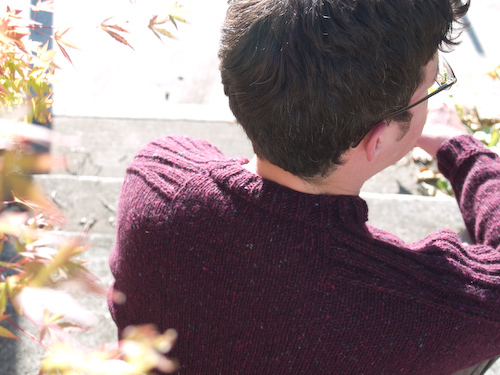 It’s free to try it out, and if you have any questions, the CEO himself will take your call in his handknit socks. How many companies can say that? Yep, I made a little goof in the R and messed up my tension trying to fix it. But overall this project went pretty quickly, and it whetted my appetite for more stranded colorwork (witness the mittens, plus another project I’ll talk about later). If I knit another of these — and given that my beloved husband ended up getting his presents in my leopard-print rubber galosh because we couldn’t find his stocking, it seems there’s need — I’ll use Hifa 3 instead. The two-ply was a little light and a little inconsistent in… I think spinners call it grist? I love me some traditional Norwegian wool, though, and the colors of the Hifa are rich and delicious. As much as I appreciate the many gorgeous luxury fibers available to knitters these days (have you looked at the ridiculous bounty of mouth-watering options available from Fleece Artist/Handmaiden alone? ), I think I’d be happy to knit nothing but old-school wool for the rest of my days. What a shame that I’m forced to spend so much of my time with laceweight cashmere these days! Shed a little tear for me, friends. I vow to take a picture of the ivy lace stole this weekend. 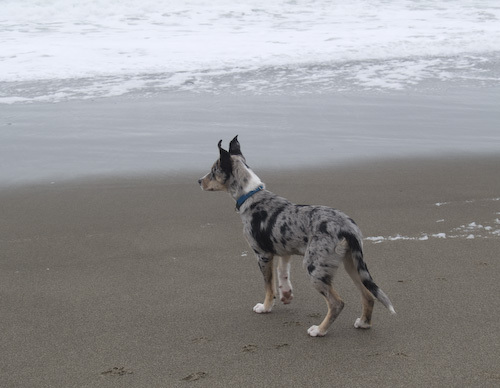 On a whim, we went to the coast yesterday. Mr. G’s parents have a little beach house south of Lincoln City, an unassuming and somewhat mildewy little pre-fab that shudders when the washer goes on spin cycle and will someday be demolished and replaced with a sturdy and charming cottage, but a beach house nonetheless, nicely nestled on an estuary teeming with grebes, buffleheads, herons, and gulls of every stripe. Mr. G was feeling knocked about after a presentation he felt he flubbed, and I had two days off in trade for working this weekend, so we packed up the dog and a change of underwear and off we went. We got a late start, but there was light enough when we arrived to cross the footbridge and tramp over the dune to see the wild waves. 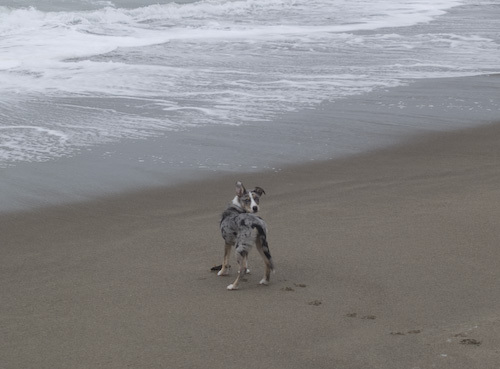 Our tough Texas pup found the ocean quite alarmingly vast, noisy, and wet. She treated us to an operatic account of her concerns, with brief intermissions to chase irresistible shreds of blowing foam. Not even a cuddle could convince her we weren’t all in mortal peril. I had a hankering for some colorwork, so last Sunday I decided to cast on and reverse-engineer this mitten from a picture in this fabulous coffee-table book of Norwegian mittens that was floating around at the yarn shop last year. The book was – you guessed it – written entirely in Norwegian, which I cannot read. Not a problem, as the book is plum stuffed with thorough charts. But as luck would have it, I fell for the design on a pair for which there was no pattern. Here’s what I know about them: “Mannsvott fra Sør-Trøndelag, Trøndelag Folkemuseum, Sverresborg FTT 28549. Vottene er strikket av Bjørg Sliper fra Trondheim, til hennes svigerfar i 1946.” I’m guessing that means they’re men’s mittens from a place called Trøndelag (which I have no idea how to pronounce), and maybe the knitter was named Bjørg Sliper, and they were either knit or donated to the Folkemuseum in 1946. Maybe some of you readers can help me out here? Anyway, I was drawn to the beautiful sprigs of berries on the cuff, and to the semi-botanical design on the back of the mitten. (Terri Shea refers to those windmills of foliage as pine boughs in her excellent Selbuvotter; I don’t recognize the other elements, but I haven’t read the book cover-to-cover yet. 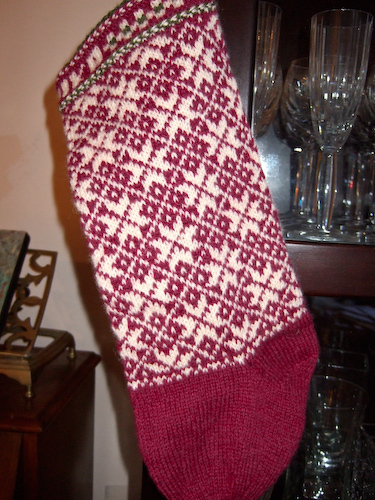 The next pair of (equally beautiful) mittens on the page in the Norwegian book is from Selbu and uses the same berry sprigs.) And wait until you see the thumbs! 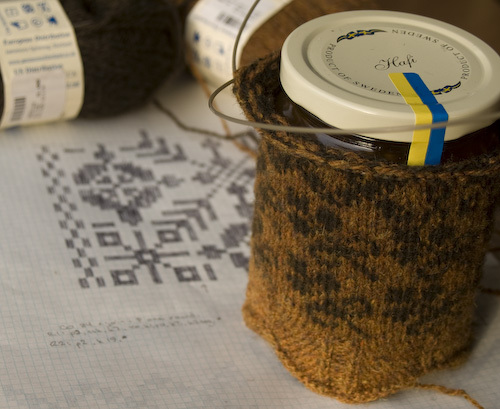 Yes, that’s a jar of Swedish cloudberry preserves modeling my mitten cuff – a cuff which was influenced by the advice of a certain Estonian, I might add – and the colors are non-traditional, and the yarn is woolen-spun Shetland, not a proper worsted Norwegian wool. This is not a strict recreation of an authentic mitten. A girl just needs a good pair of overmitts to wear to the dog park and a chance to indulge her mitten fetish, you know? 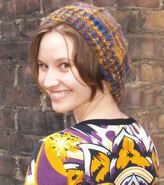 But this girl also likes nerdy knitting history, so if you know anything about these patterns I’d love to hear it!